My cousin Ian is turning 40 in a few days, so here is a peek at his birthday card. Masculine cards are a bit challenging since you have to nix the ribbons and flowers. 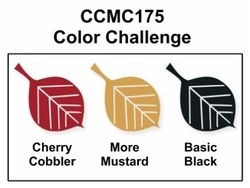 I got a lot of help this week from two great challenges, the sketch at Freshly Made Sketches #10, and the color challenge at Create with Connie and Mary, CCMC175. 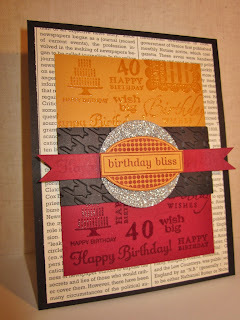 I wanted to make my own background paper, so I pulled out every Happy Birthday or Birthday related stamp that I have, and some little bitty numbers and started to stamp in versamark, after a few stamps, I decided that it would look much better if I heat embossed it, so out came the clear embossing powder. This was done for both the more mustard panel and the cherry cobbler panel. The middle panel was done with basic black that was run through the big shot with the houndstooth EF. A silver glitter circle just gave the card a little sparkle. Who says you cannot use sparkle on a man card? The birthday sentiment was popped up on a skinny banner. The main panel was layered upon a piece of the First Edition SDSP, all in all a very easy card, it probably took me longer to get the pictures taken and edited since we are having a rainy day here today. Out this goes into the mailbox so that it arrives in time. Most of these supplies are current and can be found at my ONLINE STORE that you can shop any time you would like. I hope you were inspired today, enjoy! 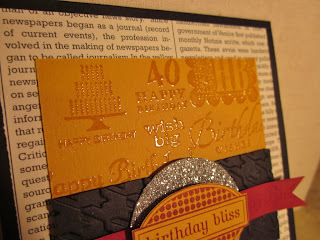 Love that embossed background - and the glimmer paper! Great job with the sketch! 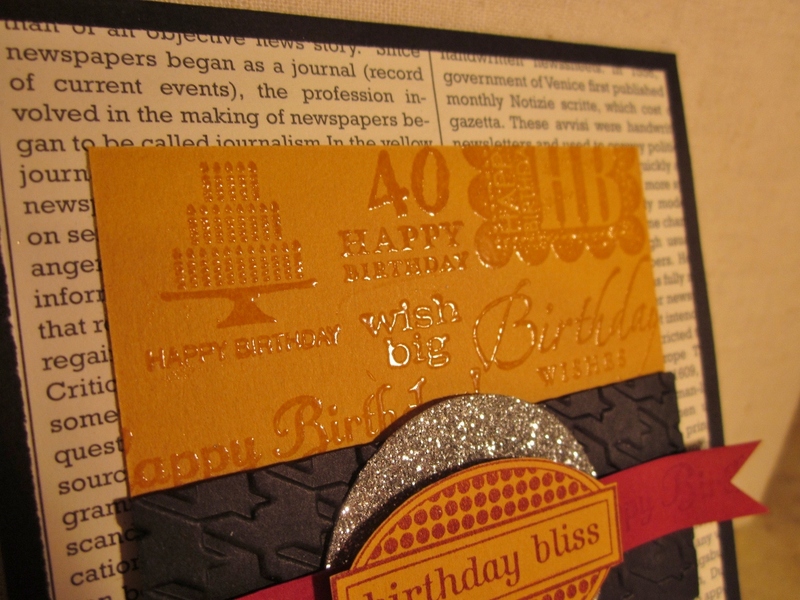 What a fantastic embossed background (both heat and dry) and I love the little bit of sparkle you added! Thanks for playing with Freshly Made Sketches this week! Lucky Ian to get such a wonderful card! 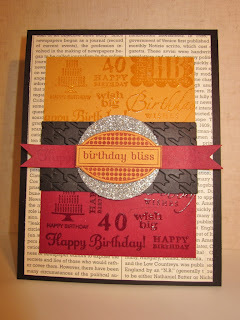 I love the colors and the design..it is a great 40th celebration! Thanks for joining Freshly Made Sketches this week! Wow ... what a super card ...love your stamped/embossed backgrounds, love the sparkly die cut ... great use of colours ... fab job!Thanks for joining us this week at Freshly Made Sketches!!! This is such a great masculine card! I love the how rich and elegant it looks! The bit of silver glimmer paper really brings out the greeting! Thanks for playing the challenge at Create with Connie and Mary! What a super cool way to use the stamp images!! Love it & the color combo. Super fun! This card would make any birthday a happy one! Thanks for playing at CCMC this week. The Glimmer Paper gives everything just the right "pop". Beautiful layout! Thanks for sharing at Create with Connie & Mary! Great idea to create your own background paper. Clear EP is a great way to jazz up a card without making it too fussy. Definitely still fits the very-difficult-to-make masculine card! Thanks for joining us at Freshly Made Sketches! What a great masculine birthday card for your cousin! The glimmer paper adds an unexpected pop! It looks great! Thanks for joining us at Freshly Made Sketches! I love all the different mediums you have going on...embossing, glimmer paper, regular stamping...they all tie together so nicely! Great masculine card. Thanks for playing the Create with Connie & Mary Challenge! I love all the details on this! The embossing, in particular, is great. So glad you joined us this week at Freshly Made Sketches! Another great card Sandie! Love the colors. Thanks for playing with Freshly Made Sketches this week! Oh my gosh Sandie! 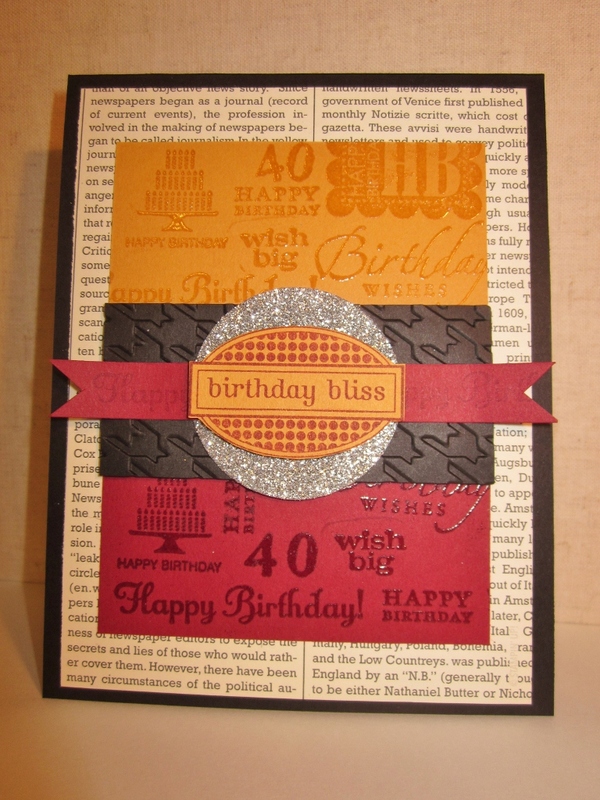 What a cool look with the embossed stamps--love the look of multiple images. 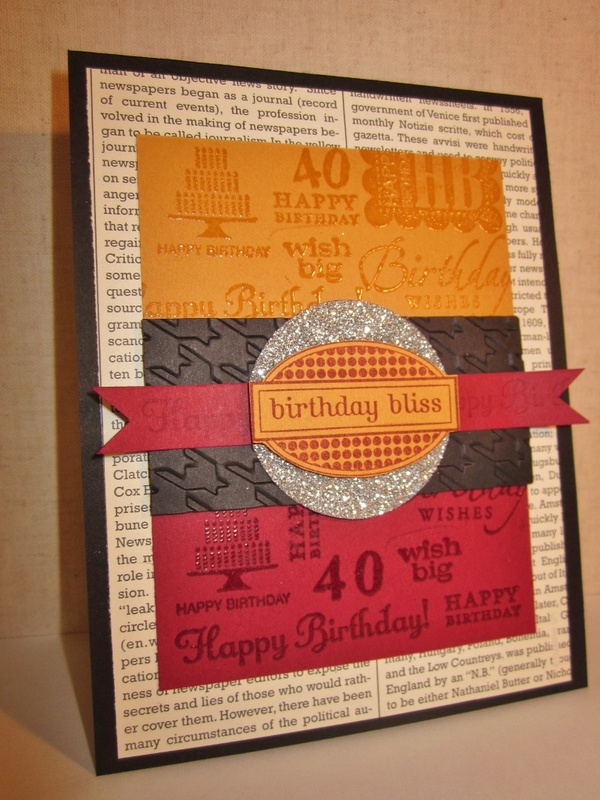 Fantastic use of the sketch and the glimmer paper is just the perfect amount of bling! So glad you joined us at CCMC! So many wonderful details on your card and such a GREAT masculine card! Thanks for joining us this week at Create with Connie and Mary Thursday Challenge! 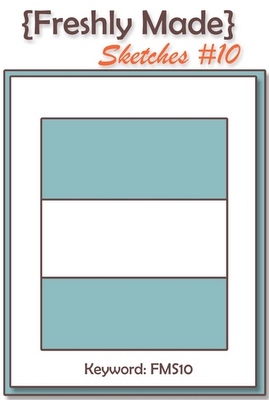 What a wonderful masculine card...can always use ideas for those! Love the subway art background! Thanks for playing along with the color challenge on Create with Connie and Mary!